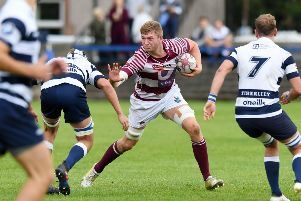 FORMER Edinburgh lock Steven Turnbull admitted his world record-breaking achievement will live long in his memory for some time after celebrating the achievement at Wooden Spoon’s Rugby Ball. Back on April 29 Turnbull, who played for Edinburgh Rugby from 2007 to 2013 before succumbing to a knee injury, joined former international rugby stars Tim Stimpson and Ollie Phillips in trekking to the Magnetic North Pole. There the 28-year-old experienced temperatures as low as minus 30C in a bid to create a Guinness World Record for the northernmost rugby match in history. Turnbull was part of Team Ollie who lost to Team Tim 17-14, and the two sides reunited on Friday evening at the star-studded Rugby Ball, Wooden Spoon’s annual flagship event. And while he wasn’t on the victorious side, Turnbull insists that raising over £200,000 for Wooden Spoon meant that all who took part were winners. “I used to play professional rugby myself for Edinburgh but I retired through injury when I was 25,” he said. “When I retired I was looking for something to do that was a bit different and a challenge, and I came across this on Twitter and didn’t think twice about it. “There wasn’t much thought that went into it, it just seemed something fantastic to be involved in and something that means a lot to me.